Iran said Monday it had confiscated three British naval vessels and arrested eight armed crew members. The Royal Navy acknowledged it had lost contact with three small patrol boats on a routine mission in the waterway between Iraq and Iran. 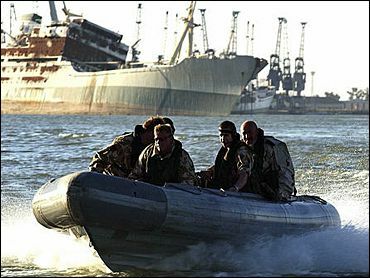 "It is not unusual for the Royal Navy to be patrolling the Shatt-al-Arab" waterway, said a British military spokesman. The Royal Navy has been training Iraqi personnel in coastal defense for several weeks on the waterway. The ministry of defense says the training team was delivering the small boats to the Iraqi river patrol service, reports CBS News Correspondent Steve Holt. "Three boats, eight persons, from the Royal Naval training team that was operating out of Basra departed on a mission for training with their fellows in the Iraqi navy," said Brig. Gen. Mark Kimmitt, deputy chief of the coalition forces in Iraq. Iranian-British relations have been strained in recent days, since London helped draft a resolution at the International Atomic Energy Agency's board of governors meeting last week in Vienna that rebuked Iran for past cover-ups involving its development of nuclear technology. Iran says its program is aimed only at producing energy, while the United States accuses Tehran of trying to develop nuclear weapons. Iran accused Britain of caving in to U.S. pressure on the resolution. The three British vessels entered Iranian territorial waters not far from the Iran-Iraq border, the Arabic language Al-Alam television reported. Iranian forces "confiscated" the vessels and eight military personnel who were on board, the report said. Iran's Foreign Ministry spokesman Hamid Reza Asefi confirmed the report, according to Iran's main Persian language TV channel. "Interrogation of those detained will continue until the matter is clarified," Asefi was quoted as saying. A Defense Ministry spokesman described the vessels as "river boat craft with outboard motors," used for training patrols, not "warships." The Iranian TV report said crew members were carrying maps and weapons. It also said the vessels were confiscated about 11 a.m. between the Bahmanshir and Arvand rivers, which would put them in the Shatt-al-Arab waterway east of the Iraqi city of Faw.